P&O Low Deposit & Onboard Spend! Secure your dream holiday with P&O for an amazing low deposit of only £25 per person! Plus, your family and friends can enjoy incredible savings with up to two guests sailing from only £1 per person when they jon two full paying adults. Plus on seletced fares, you can even get onboard spend when you book and oceanview or above. And don't forget - from May 2019 there are no service charges with P&O, meaning you can tip staff at your discretion. 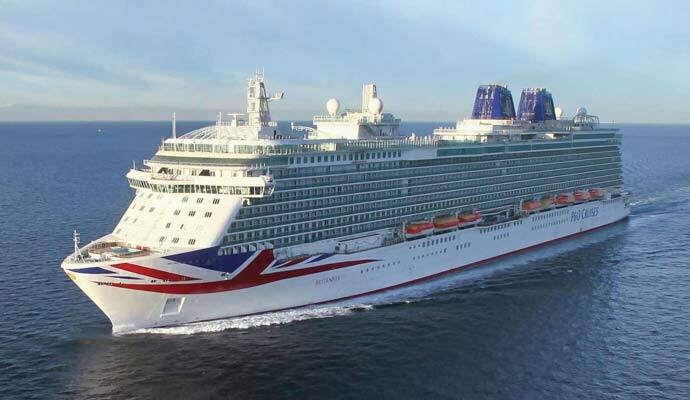 P&O consider every type of cruiser with their range of staterooms. There’s Inside, Outside, Balcony, Suites, Family Suites and Single cabins to choose from. Included in the price of your holiday you’ll find luxurious Egyptian cotton sheets, tea and coffee making facilities, fridge, hairdryer, safe, television and complimentary toiletries. You’ll also enjoy the services of a personal cabin steward who will look after your every need. As if this wasn’t enough, you can also opt for room service from early morning until late evening at no extra cost. Don’t miss out on the chance to book a balcony if you have it, each morning you can throw open your curtains to spectacular views and enjoy your breakfast in the private space of your own balcony. Enjoy a choice of relaxed and formal dining options, many of them created in collaboration with some famous faces! There’s fine dining with Marco Pierre White, modern Indian cuisine with a British twist from Atul Kochar, delightful patisserie options created by Eric Lanlard and for the perfect wine to accompany your meal, there’s a spectacular choice of labels hand-selected by specialist sommelier Olly Smith. Included in the price of your holiday you’ll enjoy breakfast, lunch and five course dinner in the main restaurants, meals and snacks from the buffet, daytime pizzaerias and grills, sandwiches, cakes and pastries at afternoon tea as well as room service at almost any time of day. Discover a different world with P&O and their diverse choice of itineraries which range from far- flung Indian Ocean destinations to charming mini cruises in Bruges. Always wanted to go snorkelling at the Great Barrier Reef? How about go whale watching in the Atlantic Ocean around the Madeira Islands? Perhaps the chance to indulge your taste buds at the fragrant street markets of Hong Kong or Vietnam is something which appeals? No matter which experiences you seek, P&O can be part of your adventure with their fleet of ships situated in destinations all over the globe. Plus, with overnight stays in more than 10 different ports including New Orleans and Barcelona – you get to spend more time exploring and enjoying the local way of life. Be as active or relaxed as you like with the range of activities available on board the P&O ships. There’s shopping opportunities in a range of boutiques, pampering spa treatments in the peaceful spa treatment rooms, the Sky Court where you can challenge friends to a game of tennis or classic game of shuffleboard and the Sun Deck where you can relax on loungers whilst being served your favourite refreshing tipple to cool you down. Whilst P&O might cater to adults-only on Adonia and Arcadia, on the rest of the fleet you can find a great family-fun atmosphere with kids clubs that cater to cruisers as young as two. These clubs include: Splashers (2-4), Surfers (5-8), Scuba’s (9-12), H20 (13-17) and there’s also a Night Nursery for children aged 6 months to 4 years, where kids can have fun whilst parents let their hair down in the evenings. If you’re feeling inspired by all of the delicious food that’s served during your cruise, then P&O offer you the chance to attend the Cookery Club so that you can learn some new recipes to take back home and wow your friends and family with. Not only are these classes a hands-on experience but some of them are even hosted by celebrity chefs like Mary Berry, James Martin and Eric Lanlard. From dazzling West-End style shows to comedy, cabaret and the soothing notes of piano music; P&O has a treasure trove of entertainment in store for you. Fans of popular BBC show ‘Strictly Come Dancing’ will revel in the opportunity to see the shows stars perform on selected sailings and may just be overcome for the chance to attend dance classes and learn flashy footwork from the pros and judges themselves. Alternatively you can see if lady luck is on your side with a flutter in the glamorous casinos, kick up your heels in one of the themed nightclubs playing a variety of music from the swinging sixties to modern chart toppers, or relax with friends in one of the many elegant bars and lounges that offer speciality cocktails, fine wines and premium spirits. Should you ever feel like having a quiet evening on board then grab some snacks and your comfiest clothes and head to the cinema where you can watch everything from black and white classics to box office hits. If you’re seeking the relaxation of an adult’s only environment then P&O present you with the opportunity to book on their smallest ship, Adonia, and one of their mid-sized ships, Arcadia. These smaller ships can access a greater variety of ports including those which are inaccessible by larger cruise ships, opening up an incredible choice of unique itineraries and destinations for your holiday. In addition to the extra choice of itineraries, guests can enjoy the expansive spa amenities, 3-tier theatre, art gallery and boutique cinema which are available on board each ship. A P&O cruise is packed with many blissful moments that will make you stop and say ‘This is the life!’ And that’s exactly how holidays should be. Whether it’s the little things like eating breakfast on your stateroom balcony with the sun shining and panoramic ocean views, being taught to dance by ‘Strictly Come Dancing’ stars, dining on incredible menus designed by Michelin Star chefs or discovering the many destinations you’ll visit along your cruise and finding out firsthand what makes them special; P&O will convince you that cruise life is the right way to live!